In his new book An Iron Wind: Europe Under Hitler, historian Peter Fritzsche examines the civilian response to the Second World War and what he finds is troubling. The war, after all, was not only a struggle between nations, but also an assault on civilian populations living in those nations. Consequently, individuals were rarely simply resistors or collaborators. 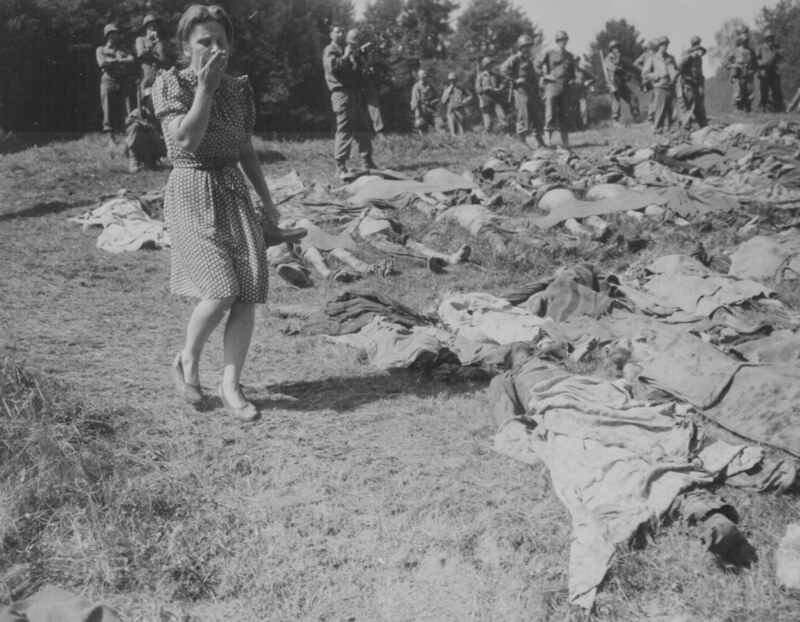 Rather, they existed in a “moral no-man’s land.” Survival, which “erased whole horizons of empathy,” quickly became the dominant priority for people under German occupation. His conclusion, finally, is that during the war, which he characterizes as “a regime of German occupation” between military engagements, civilians failed each other. Infamous photograph of German soldiers rounding up Jews for deportation in the Warsaw Ghetto, 1943. The historiography of the Second World War is vast. Fritzsche’s work distinguishes itself, however, by adopting a narrative that emphasizes civilian reaction to the war. Most accounts of German occupation, Fritzsche claims, examine the brutal policies of the Third Reich or how those policies led people to collaborate or to resist. Instead, Fritzsche’s work focuses on how people living in the so-called moral no-man’s land viewed the violence around them, how that violence affected everyday living, and even how they perceived themselves as individuals caught up in the National Socialist storm. He is interested in those who suffered and those who contributed to the suffering of others; he wants to understand how occupied people saw themselves, their neighbors, and even their conquerors. At its core, An Iron Wind is about the struggle of civilians to find meaning in the violence, but also in their own actions or inactions as they tried to weather the seemingly supernatural force of total war. Fritzsche’s book proceeds chronologically beginning with the pre-war era and concluding with the aftermath of the Holocaust. His opening chapters concentrate on how the initial phases of the war affected daily life. Gossip about the latest news of the war mattered to people trapped in the conflict, so sharing information transformed how people interacted with one another. The desire to talk and make sense of the situation also changed spatial relationships. Train stations, waiting rooms, and bomb shelters became hubs of information where people could approach each other easily for the latest information. Germans came to occupy the same spaces as civilian populations after the occupation was underway. Doing so altered the ways in which civilians viewed the average German soldier. Fritzsche is particularly interested in comparing the French and Polish accounts about sharing space with German occupiers, and how different German attitudes toward both cultures affected the civilian experience. For Fritzsche, these small shifts in daily life also revealed the ethical boundaries of people. Words could be used to distance oneself from others; shortages in basic needs justified suspicion and the pursuit of one’s self-interest. German woman overcome with emotion as she walks past victims of the German SS, 1945. That lack of comprehension is an important point to make in debunking the myth of Jewish passivity during the war. In the popular imagination, Jews became victims while other civilians in occupied nations became resistors. Fritzsche’s willingness to challenge such narratives even as they persist today is what makes An Iron Wind such an important addition to the history of the Second World War. As a work of readable scholarship, An Iron Wind is a triumph. Fritzsche skillfully blends his primary source material with higher narrative arguments to create a book that will be interesting to academics and general readers alike. Particularly impressive is his use of first-hand accounts to describe such diverse topics as the erosion of faith in republican democracy, concepts of shared space within occupied cities, the effect of extreme violence on beliefs in God, and concepts of collective memory in constructing the histories of nations. 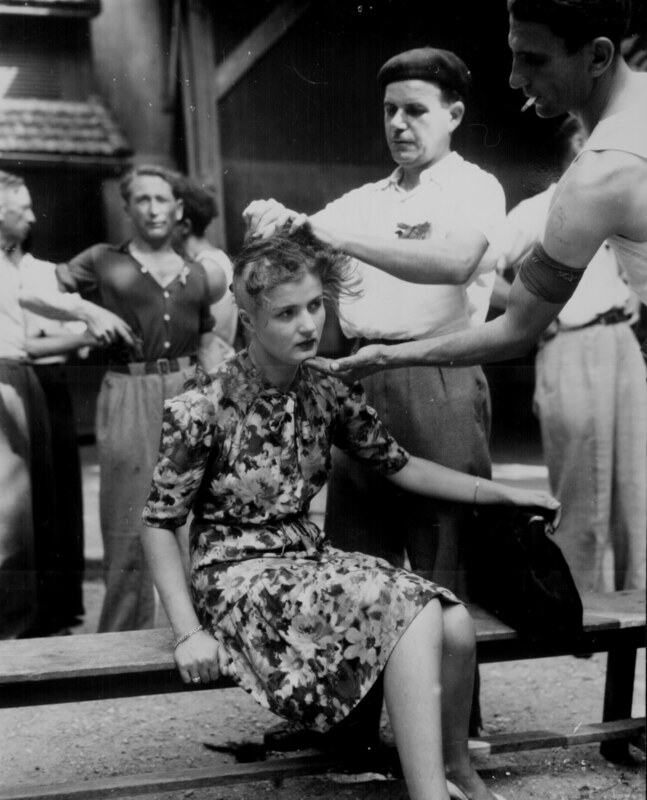 French woman forcibly has her hair cut as punishment for having relations with the Germans, 1944. Readers may be disappointed by Fritzsche’s selective focus on Poland and France at the expense of other less scrutinized areas of German influence. For example, Fritzsche’s fascinating discussion of Swiss perceptions of National Socialist aggression is mentioned in the introduction as being a major part of the study, but only appears twice to any extent later in the book. Minor gripes aside, An Iron Wind is a welcome contribution to the field. To study history is to engage fundamentally with human empathy. In this regard, An Iron Wind is an important addition to historical literature not only for its depth of research, but also its push to understand the Second World War as testing the limits of our basic assumptions about ourselves. Civilians in wartime were not always heroic resistors or cowardly collaborators, but often individuals trying to survive a seemingly otherworldly phenomenon. In the end, this is a book not only about war but about the nature of human ethics.